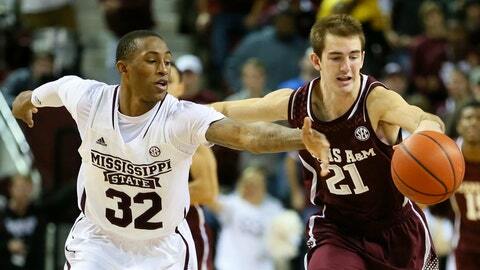 Craig Sword scored 23 points, Gavin Ware added 22 and Mississippi State beat Texas A&M 81-72 in overtime on Saturday. Mississippi State (12-5, 2-2 Southeastern Conference) rallied from a 52-42 deficit midway through the second half. Ware’s crucial steal and putback tied the game at 67 with 30 seconds left. Texas A&M’s Jamal Jones led the Aggies with 24 points, but he was ejected from the game with 1:07 remaining in overtime after receiving two quick technical fouls. Davonte Fitzgerald added 20. The Bulldogs shot 52.7 percent (29 of 55) from the field. Ware added a team-high 10 rebounds. Fitzgerald missed a long 3-pointer at the buzzer that would have won it in regulation. Texas A&M (12-5, 3-1) lost for the first time in conference play. The Aggies came into the game as a surprising co-leader in the league, matching Florida with three straight wins. They missed a good opportunity to make it 4-0, leading for most of the game before the late collapse. Texas A&M and Mississippi State both have a deliberate offense and put an emphasis on tight defense, so the sporadic scoring in the first half wasn’t a surprise. The frantic scoring in the second half and overtime was. The Bulldogs scored 14 points in overtime — including eight by Ware — to push away for the win. The Bulldogs shot 63.6 percent from the field in the second half and 62.5 percent in overtime. Colin Borchert added 14 points and Fred Thomas had 13. Texas A&M came into the game giving up 60.2 points per game, but couldn’t stop the Bulldogs when it mattered most. Things turned ugly late in overtime when Texas A&M’s Jones and Mississippi State’s Thomas received technical fouls after exchanging words. Then Jones picked up another technical as he walked to the bench and had to be escorted off the floor by Texas A&M assistants. The Aggies jumped out to an early 15-7 lead, but the Bulldogs slowly fought back when a few outside jumpers finally went down. Shooting has been a struggle all season for Mississippi State, which came into the game a league-worst 29.1 percent from 3-point range. But Sword hit his first from behind the arc in more than a month to pull Mississippi State within 26-24. Then Thomas’ 3-pointer gave the Bulldogs a 27-26 lead going into halftime. The Aggies quickly reclaimed the lead early in the second half and Jones knocked down a 3-pointer with 10:30 remaining to push Texas A&M ahead 52-42. But Mississippi State was just getting started. Sword and Ware hit several clutch shots down the stretch for the Bulldogs, who have already won more games this season than all of last year.